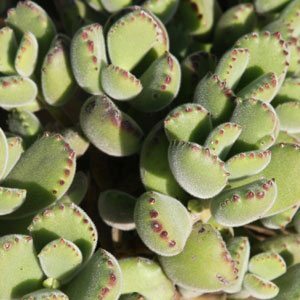 Cotyledon species and plants are a group of summer flowering succulents from South Africa. They are characterised by the tubular flowers and thick fleshy leaves, the flowers are of a pendulous nature, usually on appearing on upright stems. Cotyledon undulata has nice pink flowers, and does well in a container or pot as a specimen. The genus can be divided into two groups. One is the evergreen perennials and the other are a group of deciduous plants. Species and cultivars include : C. orbiculata ‘Silver Waves’ , C. undulata, C. macrantha ‘Paddle Plant’ or ‘Lipstick plants’ and C. tomentosa with its soft foliage. C. tomentosa is one of the more widely found species, with C.tomentosa ladiismithiensis being readily available. Often called ‘Bears Foot’ or ‘Bears Claws’ for the look of the foliage. Along with Cotyledon orbiculata these two are probably the most common of this species. Like most succulents they prefer a well drained growing medium and a sunny position and are generally regarded as drought tolerant. Use a free draining succulent potting mix, and a position in good bright filtered light for best results. Good air flow and low humidity will help prevent fungal problems. All species can easily be pruned to maintain shape. C. undulata ‘Silver Ruffles’ is a popular species, C. velutina is worth seeking, C. macrantha has a shrubby habit and will grow to almost 1m. C. orbiculata ‘Oophylla’ is an excellent succulent for dry shade, a most useful addition to the garden.